When I was a child, there was no Halloween in Germany. We celebrated Fasching, and I dressed up as a native American, a princess, or a cowboy. Things have changed around here. Last night, we met some of Nova's Kita friends to roam the streets of our neighborhood and try some trick or treating. One mom had organized the route, with a few designated apartments of friends, where we could be sure people would be home and dole out sweets. 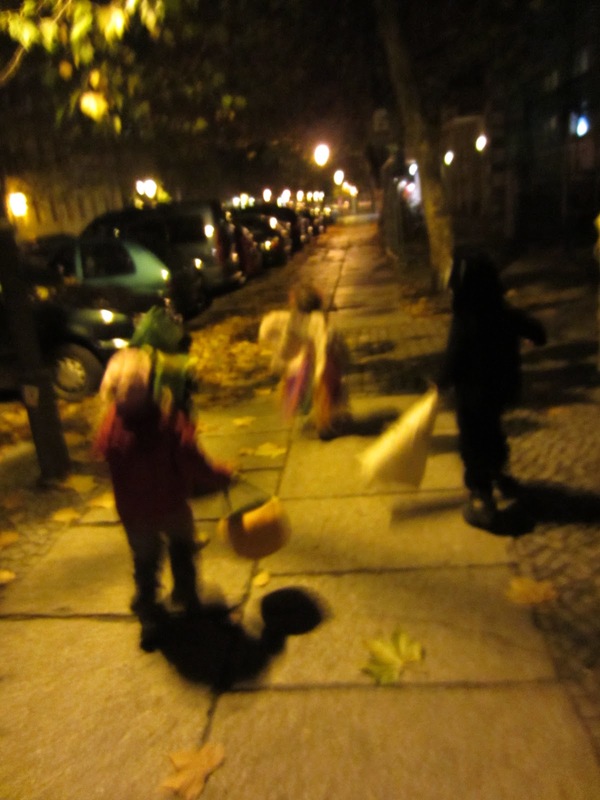 The kids, holding hands, were running down the lantern-lit streets, covered with leaves. And there were so many others: Berlin children and teenagers, all dressed up in spooky outfits (my favorite one: a ghost with a boom box on his shoulder, blaring Peter Fox songs). Where did all these German Halloween kids come from? Besides our friends, who put candles and pumpkins in the stairwells to guide us to the right floor, many shops and restaurants in our neighborhood stayed open late and were prepared for little ghosts: A baker welcomed us with bonbons, an Italian restaurant offered cookies, and the wonderful Saint George's Book Store had a basket filled with chocolate bars. After our nightly wanderings, we went back to our friend's house for some carrot soup and Mac'n Cheese. And more candy. My earliest Halloween memory was when I was allowed to eat all of the candy I insisted on eating that night. I had "no sugar parents" so they thought it would work like making your kid smoke the whole pack of cigarettes because they caught you smoking one... Of course I got sick but I wasn't cured of my sweet tooth.